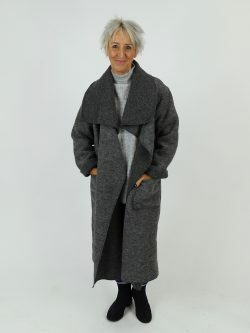 The Made in Italy Phoebe Wool Coat is one of our best selling pieces at Kit and Kaboodal. Crafted from boiled wool and available is so many great shades this coat is a must-have piece. 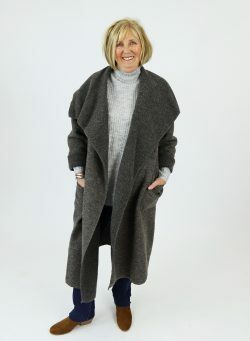 Our favourite aspect of this coat has to be the waterfall front giving it a flattering and feminine feel! The only dilemma you might face this season is how to style the piece all winter long. Worry not, this coat is easy to wear and looks brilliant with so many pieces. Let our team tell you how we are styling the Phoebe this season. One of the easiest ways to wear a Phoebe coat is simply with jeans. The beauty of the Phoebe is that it can easily be thrown over almost every outfit, so if your keeping it casual in jeans and boots this style will pair perfectly. The Only skinny jeans are our favourite style to wear with this longline coat. Skinny jeans are also brilliant because they tuck into chunky winter boots easily for the complete winter look. 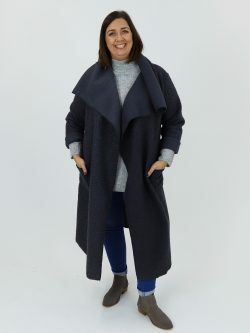 The Phoebe coat has plenty of room in the arms making it perfect for layering over chunky winter knits! Styles like the Falmer, Spennymoor and the Orleans will all layer under perfectly. So if you have any favourite knits you can most definitely wear them with the Phoebe coat. 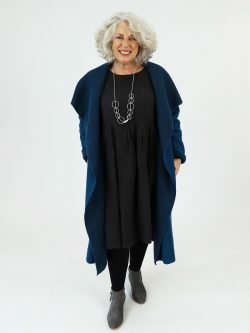 Plus, because this coat is fastening free you don’t need to worry about bulkyness, just keep on layering and keep it cosy! 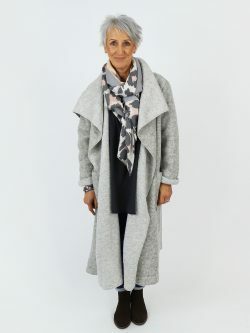 If you are feeling the chill or want to add colour or pattern then a scarf is the perfect accessory for the Phoebe coat. Go for a chunky knitted style in the daytime or glam it up with a more sheer style, the choice is all yours. A scarf will also give you that added bit of warmth on a very chilly winter day. So why not follow the trends and add an animal print scarf such as the Sabana or Scarlet to keep you looking stylish all season long. If you want to feel a bit feminine this season then why not add the Windsor petticoat and the Zouch dress underneath your Phoebe for an elegant look. Teaming this style with dresses makes it a little bit more glamorous so it’s perfect for wearing on an evening! 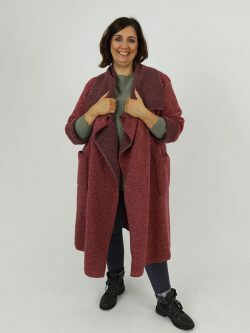 We love the look of the petticoat layers peeping out of the bottom of the coat, it will instantly make you feel festive and fashionable whilst you do your winter shopping. Complete your look with some chunky or heeled boots. We have so many styles of shoes that will pair perfectly with the Phoebe coat. So wether you fancy a high leg style like the Savannah boots, or fancy a heel with the Lowry boots, or maybe you want to keep it more casual with the Caitlyn boots, it’s all possible. The length of this coat pairs perfectly with all styles of boots so invest now and be set for the season. All you have to do now is pick your favourite colour and you are dressed for success. 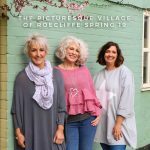 We love to see how you style your Phoebe so don’t forget to send us a selfie on Facebook, Twitter or Instagram in this must-have style for the season.